Drop-down list values for your Store are added from Tools > Edit Settings > Drop Down Lists. Add Class Category 1, Item Tax Rates, Quick Discount percentages, and Transaction Types as needed. 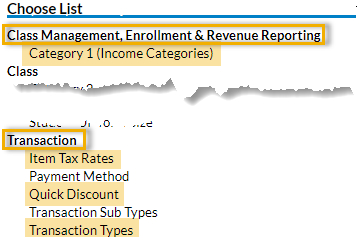 Category 1 names are used to organize revenue and are not isolated to classes. Example: You might want a Category 1 value called Merchandise or Food. When entering tax rates, enter the number only. Example: A 5% tax rate should be entered as 5, not as .05. Item Tax Rates are only used for items and not available for other types of fees. You may use a Transaction Type already created or create new ones unique to your store.